As reported earlier, Hustler Casino had their Heads-Up tournament today starting at 2pm. The picture above shows the 64 brackets that sort of looks like the NCAA brackets. Because Hustler added $2,500 to the prize pool, there was an automatic overlay for this tournament to the winners. 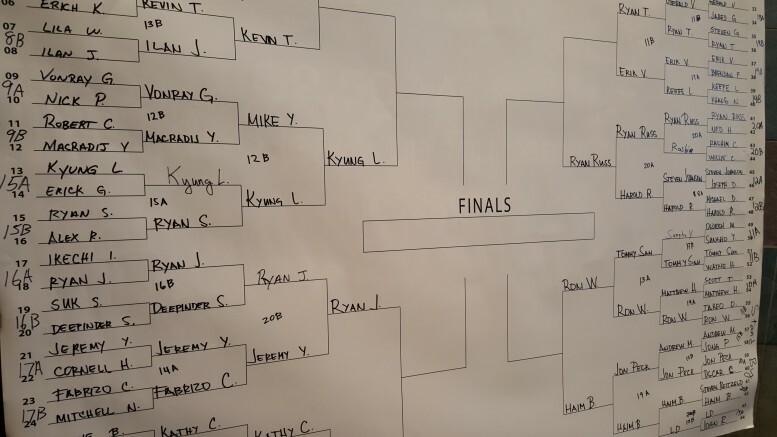 At the time that I left the tournament, the final heads-up was about to start with Ryan vs. Ryan for 1st place. So I can safely report that Ryan was the eventual winner. The Liz Flynt Spring Poker Classic continues through May 1. See their schedule here. Be the first to comment on "Hustler Casino Liz Flynt Heads-Up Tournament"